The EL3201 analog input terminal allows resistance sensors to be connected directly. The EtherCAT Terminal circuitry can operate 2-, 3- and 4-wire sensors (also in the 2-channel version EL3202-0010). A microprocessor handles linearisation across the whole temperature range, which is freely selectable. The EtherCAT Terminal’s standard settings are: resolution 0.1 °C in the temperature range of PT100 sensors in 3-wire connection. 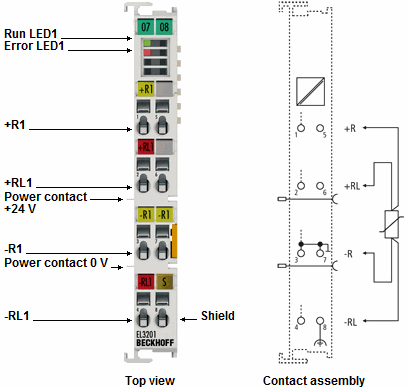 The EtherCAT Terminals indicate their signal state by means of light emitting diodes. Sensor malfunctions such as broken wires are indicated by error LEDs.